As we get older, our eyes stop expressing who we really are to the world. As unfortunate it may be, aging can cause us to develop hooded, drooping upper eyelids that make us look much more tired-and older-than we really feel. But if you’re ready to reveal the more vibrant version of you, then Dr. Machida can help you with a remarkable procedure called an upper blepharoplasty. An upper blepharoplasty is a procedure that tightens droopy upper eyelids to create a more vibrant, refreshed look. 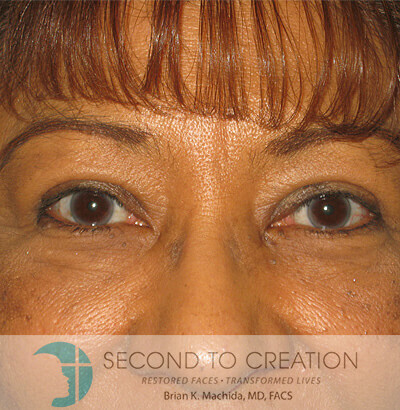 At Second to Creation, our upper blepharoplasty will be performed in way that helps you look younger–not like a different person. 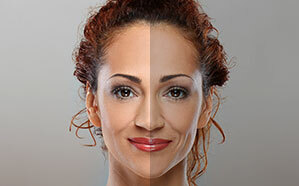 With the right surgical techniques and his in-depth understanding of facial aesthetics, Dr. Machida can help you look refreshed without sacrificing your unique look. 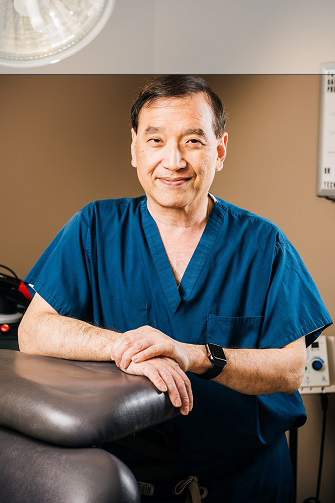 Dr. Machida is known for his work with facial plastic surgery, and he takes great pains to make sure your upper blepharoplasty results look as natural and balanced as possible. At Second to Creation, we know it’s more than a fresh new look–it’s a fresh new start. It’s a great responsibility, and Dr. Machida takes every precaution to make sure your upper blepharoplasty will be aesthetically and functionally impeccable. Am I a Candidate for Upper Blepharoplasty? Dr. Machida treats every patient like family. As a practice, we’ve cultivated an environment where our patients can feel at peace during every step of their plastic surgery experience. On the day of your consultation, you’ll be welcomed into our modern, private medical center and brought in to meet with our consultant. After some preliminary discussion about the upper blepharoplasty, you’ll be able to meet with Dr. Machida himself. Keep in mind that the consultation is the perfect place to bring up questions and concerns about the upper blepharoplasty. Dr. Machida believes that every patient should be heard, and he’ll listen intently to any questions you might have and answer them in detail. Each consultation typically begins with the two of you going over your medical history. Then, Dr. Machida will thoroughly analyze your facial characteristics to determine a plan for your upper blepharoplasty. He’ll also go over detailed instructions on how you can best prepare for your upper blepharoplasty and recovery from surgery. In an upper blepharoplasty, an incision will be made near the natural crease of the upper lid. Then, he’ll remove skin that’s not required for closing the eye. Then, fat deposits are shifted around the inner corner of the eyelid to reduce puffiness. 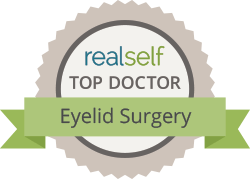 Dr. Machida will give you specific instructions on how to recover successfully from an upper blepharoplasty. The instructions will guide you on how to clean the treated area, how to sleep during your recovery, and when you can return to your daily activities. In general, patients tend to recover quickly from an upper blepharoplasty. They’re usually able to return to work 5-7 days after their surgery, and they experience some minor side effects for a few weeks. The minor side effects vary from patient-to-patient, but they’re usually in the form of numbness, swelling, and bruising. Once the few weeks have passed and the swelling has dissipated, you’ll be able to see your full results. Dr. Machida will monitor your recovery closely to make sure you’re safe and comfortable. 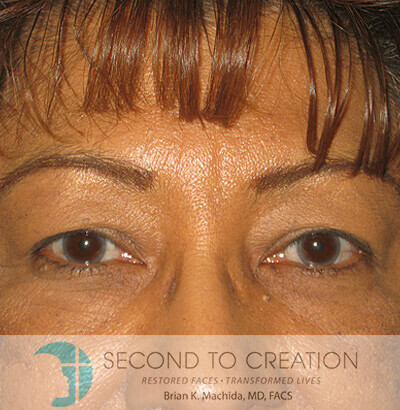 You’ll return to Second to Creation the day after, the week after, and then a month after the upper blepharoplasty so that Dr. Machida can see how well you’re healing. Your eyes define your look, so it’s crucial that you find the right surgeon to repair your eyelids. That’s why Second to Creation is proud to be led by Dr. Machida, a renowned facial plastic surgery specialist that’s performed over 10,000 facial plastic surgery procedures. At Second to Creation, we’re passionate about introducing beauty back into your life, whether that means supporting you through the process or helping you achieve the most natural-looking results possible. Dr. Machida knows that your upper blepharoplasty is about instilling confidence and pride, which is why he strives to create stunning results time and time again. If you’d love to know more about the Upper Blepharoplasty, contact Second to Creation now or call: (800) 303-9541 for a consultation. Can I Combine the Upper Blepharoplasty with Other Procedures? The upper blepharoplasty can be easily combined with a lower blepharoplasty, a facelift, a brow lift, and other facial plastic surgery procedures. How Do I Know If I Need an Upper Blepharoplasty? There are times when a patient wants an upper blepharoplasty, but what they really need is a brow lift or a combination of both. To find out if you still need an upper blepharoplasty, look in mirror and use your finger to lift up your eyebrows. If you lift up your eyebrows and you still see a sagging upper eyelid, then you need an upper blepharoplasty. If you lift up your eyebrows and your eyelids also raise up, then you might only need a brow lift. Why Do Our Upper Eyelids Droop? There are quite a few factors that cause “hooded,” or drooping upper eyelids to develop. One factor is the decrease in collagen in the skin. This leads to looser, less elastic eyelids. The muscles also become less toned, which further exacerbates the drooping. Finally, the fat pads in the eyelid begin to shift forward, creating a look of puffiness. Dr. Machida will address the appropriate tissues and use the proper techniques to create a more youthful look in the upper eyelids. Any scarring that occurs will be neatly hidden by the natural folds of the eye. And once the scars have faded substantially, they’ll be even more difficult to see with the naked eye. This should happen in a matter of months, maybe a year at most. The results of your upper blepharoplasty will last for many years, but you will continue to age after your upper blepharoplasty. As long as your take care of your skin, your results will last for as long as possible.